This article is about the national anthem of the United States. For the flag that flew over Fort McHenry, see Star-Spangled Banner (flag). For the present flag, see flag of the United States. 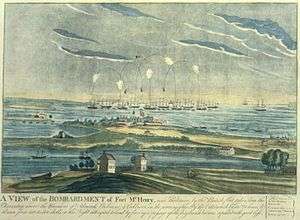 One of two surviving copies of the 1814 broadside printing of the "Defence of Fort McHenry", a poem that later became the lyrics of the national anthem of the United States. "The Star-Spangled Banner" is the national anthem of the United States of America. The lyrics come from "Defence of Fort M'Henry", a poem written on September 14, 1814, by the 35-year-old lawyer and amateur poet Francis Scott Key after witnessing the bombardment of Fort McHenry by British ships of the Royal Navy in Baltimore Harbor during the Battle of Baltimore in the War of 1812. 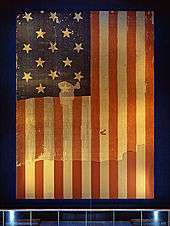 Key was inspired by the large American flag, the Star-Spangled Banner, flying triumphantly above the fort during the American victory. The poem was set to the tune of a popular British song written by John Stafford Smith for the Anacreontic Society, a men's social club in London. "To Anacreon in Heaven" (or "The Anacreontic Song"), with various lyrics, was already popular in the United States. Set to Key's poem and renamed "The Star-Spangled Banner", it soon became a well-known American patriotic song. With a range of one octave and one fifth (a semitone more than an octave and a half), it is known for being difficult to sing. Although the poem has four stanzas, only the first is commonly sung today. Before 1931, other songs served as the hymns of American officialdom. "Hail, Columbia" served this purpose at official functions for most of the 19th century. "My Country, 'Tis of Thee", whose melody is identical to "God Save the Queen", the British national anthem, also served as a de facto anthem. 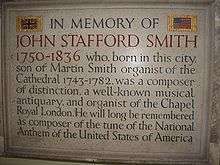 Following the War of 1812 and subsequent American wars, other songs emerged to compete for popularity at public events, among them "The Star-Spangled Banner", as well as "America the Beautiful". 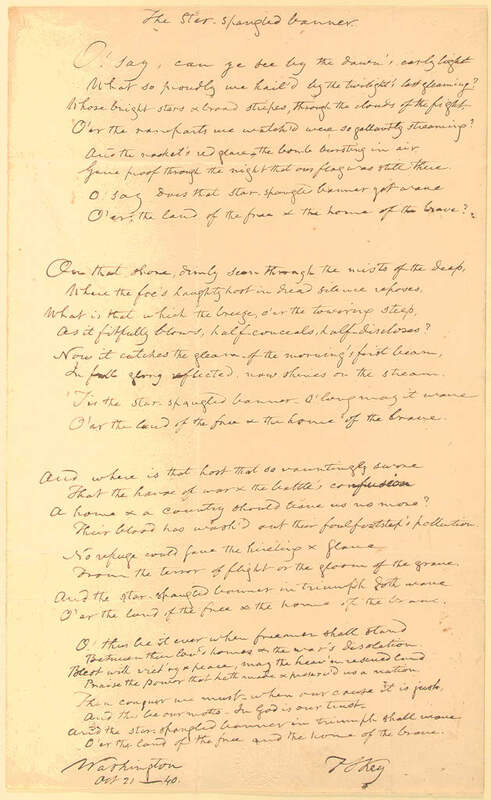 Francis Scott Key's original manuscript copy of his "Star-Spangled Banner" poem. It is now on display at the Maryland Historical Society. On September 3, 1814, following the Burning of Washington and the Raid on Alexandria, Francis Scott Key and John Stuart Skinner set sail from Baltimore aboard the ship HMS Minden, flying a flag of truce on a mission approved by President James Madison. Their objective was to secure an exchange of prisoners, one of whom was Dr. William Beanes, the elderly and popular town physician of Upper Marlboro and a friend of Key's who had been captured in his home. Beanes was accused of aiding the arrest of British soldiers. Key and Skinner boarded the British flagship HMS Tonnant on September 7 and spoke with Major General Robert Ross and Vice Admiral Alexander Cochrane over dinner while the two officers discussed war plans. At first, Ross and Cochrane refused to release Beanes, but relented after Key and Skinner showed them letters written by wounded British prisoners praising Beanes and other Americans for their kind treatment. Key was inspired by the American victory and the sight of the large American flag flying triumphantly above the fort. This flag, with fifteen stars and fifteen stripes, had been made by Mary Young Pickersgill together with other workers in her home on Baltimore's Pratt Street. The flag later came to be known as the Star-Spangled Banner and is today on display in the National Museum of American History, a treasure of the Smithsonian Institution. It was restored in 1914 by Amelia Fowler, and again in 1998 as part of an ongoing conservation program. Aboard the ship the next day, Key wrote a poem on the back of a letter he had kept in his pocket. 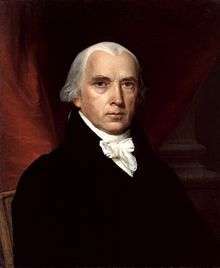 At twilight on September 16, he and Skinner were released in Baltimore. He completed the poem at the Indian Queen Hotel, where he was staying, and titled it "Defence of Fort M'Henry". 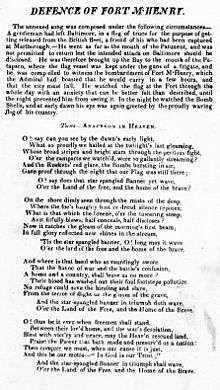 Much of the idea of the poem, including the flag imagery and some of the wording, is derived from an earlier song by Key, also set to the tune of "The Anacreontic Song". The song, known as "When the Warrior Returns", was written in honor of Stephen Decatur and Charles Stewart on their return from the First Barbary War. Absent elaboration by Francis Scott Key prior to his death in 1843, some have speculated in modern times about the meaning of phrases or verses. According to British historian Robin Blackburn, the words "the hireling and slave" allude to the thousands of ex-slaves in the British ranks organised as the Corps of Colonial Marines, who had been liberated by the British and demanded to be placed in the battle line "where they might expect to meet their former masters" (even though Britain still practiced slavery) -- a tactic later used by President Lincoln's Emancipation Proclamation which applied only to slaves in rebelling states but not Union ones. Professor Mark Clague has stated that the "middle two verses of Key's lyric vilify the British enemy in the War of 1812" and "in no way glorifies or celebrates slavery." Clague asserts that the language used to refer to "British professional soldiers (hirelings) but also the Corps of Colonial Marines (slaves)" which Key viewed as "scoundrels and ... traitors who threatened to spark a national insurrection," led to the omission of the third verse during World War I when Britain was an ally. Others contend it speaks to checkered allegiances with "hireling" referring to mercenaries motivated by money not country and enlisted Americans "who so vauntingly swore" loyalty only to turn "slave" by the long-standing British practice of impressment, which rejoins the song's preceding line of "Their blood has washed out their foul footsteps pollution" of invaders under the British flag. After the U.S. and the British signed a peace treaty at the end of 1814, the U.S. government demanded the return of American “property,” which by that point numbered about 6,000 freed slaves. The British refused. Most of the 6,000 eventually settled in Canada, with some going to Trinidad. 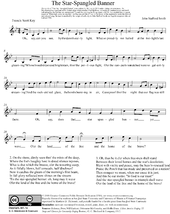 On September 20, both the Baltimore Patriot and The American printed the song, with the note "Tune: Anacreon in Heaven". The song quickly became popular, with seventeen newspapers from Georgia to New Hampshire printing it. Soon after, Thomas Carr of the Carr Music Store in Baltimore published the words and music together under the title "The Star Spangled Banner", although it was originally called "Defence of Fort M'Henry". The song's popularity increased, and its first public performance took place in October, when Baltimore actor Ferdinand Durang sang it at Captain McCauley's tavern. Washington Irving, then editor of the Analectic Magazine in Philadelphia, reprinted the song in November 1814. The Italian opera composer Giacomo Puccini used an extract of the melody in writing the aria "Dovunque al mondo..." in 1904 for his work Madama Butterfly. The song gained popularity throughout the 19th century and bands played it during public events, such as July 4th celebrations. 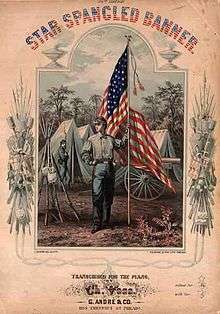 On July 27, 1889, Secretary of the Navy Benjamin F. Tracy signed General Order #374, making "The Star-Spangled Banner" the official tune to be played at the raising of the flag. In 1916, President Woodrow Wilson ordered that "The Star-Spangled Banner" be played at military and other appropriate occasions. The playing of the song two years later during the seventh-inning stretch of Game One of the 1918 World Series, and thereafter during each game of the series is often cited as the first instance that the anthem was played at a baseball game, though evidence shows that the "Star-Spangled Banner" was performed as early as 1897 at opening day ceremonies in Philadelphia and then more regularly at the Polo Grounds in New York City beginning in 1898. In any case, the tradition of performing the national anthem before every baseball game began in World War II. On April 10, 1918, John Charles Linthicum, U.S. Congressman from Maryland, introduced a bill to officially recognize "The Star-Spangled Banner" as the national anthem. The bill did not pass. On April 15, 1929, Linthicum introduced the bill again, his sixth time doing so. On November 3, 1929, Robert Ripley drew a panel in his syndicated cartoon, Ripley's Believe it or Not!, saying "Believe It or Not, America has no national anthem". In 1930, Veterans of Foreign Wars started a petition for the United States to officially recognize "The Star-Spangled Banner" as the national anthem. Five million people signed the petition. The petition was presented to the United States House Committee on the Judiciary on January 31, 1930. On the same day, Elsie Jorss-Reilley and Grace Evelyn Boudlin sang the song to the Committee to refute the perception that it was too high pitched for a typical person to sing. The Committee voted in favor of sending the bill to the House floor for a vote. The House of Representatives passed the bill later that year. The Senate passed the bill on March 3, 1931. President Herbert Hoover signed the bill on March 4, 1931, officially adopting "The Star-Spangled Banner" as the national anthem of the United States of America. ^ Francis Scott Key, The Star Spangled Banner (lyrics), 1814, MENC: The National Association for Music Education National Anthem Project (archived from the original Archived January 26, 2013, at the Wayback Machine. on 2013-01-26). In indignation over the start of the American Civil War, Oliver Wendell Holmes, Sr. added a fifth stanza to the song in 1861, which appeared in songbooks of the era. In a version hand-written by Francis Scott Key in 1840, the third line reads "Whose bright stars and broad stripes, through the clouds of the fight". "The Star-Spangled Banner" is traditionally played at the beginning of public sports events and orchestral concerts in the United States, as well as other public gatherings. The National Hockey League and Major League Soccer both require venues in both the U.S. and Canada to perform both the Canadian and American national anthems at games that involve teams from both countries (with the "away" anthem being performed first) . It is also usual for both American and Canadian anthems (done in the same way as the NHL and MLS) to be played at Major League Baseball and National Basketball Association games involving the Toronto Blue Jays and the Toronto Raptors (respectively), the only Canadian teams in those two major U.S. sports leagues, and in All Star Games on the MLB, NBA, and NHL. The Buffalo Sabres of the NHL, which play in a city on the Canada–US border and have a substantial Canadian fan base, play both anthems before all home games regardless of where the visiting team is based. The first popular music performance of the anthem heard by mainstream America was by Puerto Rican singer and guitarist José Feliciano. He created a nationwide uproar when he strummed a slow, blues-style rendition of the song at Tiger Stadium in Detroit before game five of the 1968 World Series, between Detroit and St. Louis. This rendition started contemporary "Star-Spangled Banner" controversies. The response from many in Vietnam-era America was generally negative. Despite the controversy, Feliciano's performance opened the door for the countless interpretations of the "Star-Spangled Banner" heard in the years since. One week after Feliciano's performance, the anthem was in the news again when American athletes Tommie Smith and John Carlos lifted controversial raised fists at the 1968 Olympics while the "Star-Spangled Banner" played at a medal ceremony. Marvin Gaye gave a soul-influenced performance at the 1983 NBA All-Star Game and Whitney Houston gave a soulful rendition before Super Bowl XXV in 1991, which was released as a single that charted at number 20 in 1991 and number 6 in 2001 (along with José Feliciano, the only times the anthem has been on the Billboard Hot 100). In 1993, Kiss did an instrumental rock version as the closing track on their album, Alive III. Another famous instrumental interpretation is Jimi Hendrix's version, which was a set-list staple from autumn 1968 until his death in September 1970, including a famous rendition at the Woodstock music festival in 1969. 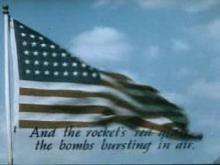 Incorporating sonic effects to emphasize the "rockets' red glare", and "bombs bursting in air", it became a late-1960s emblem. Roseanne Barr gave a controversial performance of the anthem at a San Diego Padres baseball game at Jack Murphy Stadium on July 25, 1990. The comedian belted out a screechy rendition of the song, and afterward she attempted a gesture of ball players by spitting and grabbing her crotch as if adjusting a protective cup. The performance offended some, including the sitting U.S. President, George H. W. Bush. Sufjan Stevens has frequently performed the "Star-Spangled Banner" in live sets, replacing the optimism in the end of the first verse with a new coda that alludes to the divisive state of the nation today. David Lee Roth both referenced parts of the anthem and played part of a hard rock rendition of the anthem on his song, "Yankee Rose" on his 1986 solo album, Eat 'Em and Smile. Steven Tyler also caused some controversy in 2001 (at the Indianapolis 500, to which he later issued a public apology) and again in 2012 (at the AFC Championship Game) with a cappella renditions of the song with changed lyrics. A version of Aerosmith's Joe Perry and Brad Whitford playing part of the song can be heard at the end of their version of "Train Kept A-Rollin'" on the Rockin' the Joint album. The band Boston gave an instrumental rock rendition of the anthem on their Greatest Hits album. The band Crush 40 made a version of the song as opening track from the album Thrill of the Feel (2000). Several films have their titles taken from the song's lyrics. These include two films titled Dawn's Early Light (2000 and 2005); two made-for-TV features titled By Dawn's Early Light (1990 and 2000); two films titled So Proudly We Hail (1943 and 1990); a feature (1977) and a short (2005) titled Twilight's Last Gleaming; and four films titled Home of the Brave (1949, 1986, 2004, and 2006). United States Code, 36 U.S.C. § 301, states that during a rendition of the national anthem, when the flag is displayed, all present except those in uniform should stand at attention facing the flag with the right hand over the heart; Members of the Armed Forces and veterans who are present and not in uniform may render the military salute; men not in uniform should remove their headdress with their right hand and hold the headdress at the left shoulder, the hand being over the heart; and individuals in uniform should give the military salute at the first note of the anthem and maintain that position until the last note; and when the flag is not displayed, all present should face toward the music and act in the same manner they would if the flag were displayed. Military law requires all vehicles on the installation to stop when the song is played and all individuals outside to stand at attention and face the direction of the music and either salute, in uniform, or place the right hand over the heart, if out of uniform. A law passed in 2008 allows military veterans to salute out of uniform, as well. However, this statutory suggestion does not have any penalty associated with violations. 36 U.S.C. § 301 This behavioral requirement for the national anthem is subject to the same First Amendment controversies that surround the Pledge of Allegiance. For example, Jehovah's Witnesses do not sing the national anthem, though they are taught that standing is an "ethical decision" that individual believers must make based on their "conscience." The 1968 Olympics Black Power salute was a political demonstration conducted by African-American athletes Tommie Smith and John Carlos during their medal ceremony at the 1968 Summer Olympics in the Olympic Stadium in Mexico City. After having won gold and bronze medals respectively in the 200 meter running event, they turned on the podium to face their flags, and to hear the American national anthem, "The Star-Spangled Banner". Each athlete raised a black-gloved fist, and kept them raised until the anthem had finished. In addition, Smith, Carlos, and Australian silver medalist Peter Norman all wore human rights badges on their jackets. In his autobiography, Silent Gesture, Smith stated that the gesture was not a "Black Power" salute, but a "human rights salute". The event is regarded as one of the most overtly political statements in the history of the modern Olympic Games. Politically motivated protests of the national anthem began in the National Football League (NFL) after San Francisco 49ers quarterback (QB) Colin Kaepernick sat during the anthem, as opposed to the tradition of standing, before his team's third preseason game of 2016. Kaepernick also sat during the first two preseason games, but he went unnoticed. Since then other NFL players have also protested during the anthem in various ways. The protests have generated mixed reactions and have since spread to other U.S. sports leagues. 1 2 ""Star-Spangled Banner" Is Now Official Anthem". The Washington Post. March 5, 1931. p. 3. ↑ "Library of Congress: Defence of Fort M'Henry". ↑ "My country 'tis of thee [Song Collection]". The Library of Congress. Retrieved 2009-01-20. ↑ Snyder, Lois Leo (1990). Encyclopedia of Nationalism. Paragon House. p. 13. ISBN 1-55778-167-2. ↑ British Rockets at the US National Park Service, Fort McHenry National Monument and Historic Shrine. Retrieved February 2008. Archived April 3, 2014, at the Wayback Machine. ↑ "When the Warrior Returns". ↑ Blackburn, Robin (1988). The Overthrdow of Colonial Slavery, 1776–1848. pp. 288–290. ↑ Clague, Mark. "'Star-Spangled Banner' critics miss the point". ↑ Emery, David. "'The Star-Spangled Banner' and Slavery". ↑ "Progressives Put The Star Spangled Banner On Their Chopping Block". ↑ Becker, Kyle (31 August 2016). "The National Anthem Does Not 'Celebrate Slavery': The Meaning of Lyric Used to Defend Kaepernick". ↑ "Is the National Anthem Racist? Beyond the Debate Over Colin Kaepernick". 3 September 2016 – via The New York Times. ↑ "The National Anthem Is a Celebration of Slavery". 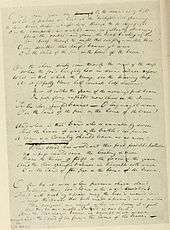 ↑ Standardization Manuscript for The Star Spangled Banner on Antiques Roadshow (U.S.). ↑ "Cubs vs Red Sox 1918 World Series: A Tradition is Born". ↑ "Musical traditions in sports". CNN. 1 2 3 "National Anthem Hearing Is Set For January 31". The Baltimore Sun. January 23, 1930. p. 4. 1 2 "5,000,000 Sign for Anthem: Fifty-Mile Petition Supports "The Star-Spangled Banner" Bill". The New York Times. January 19, 1930. p. 31. ↑ "5,000,000 Plea For U.S. Anthem: Giant Petition to Be Given Judiciary Committee of Senate Today". The Washington Post. January 31, 1930. p. 2. ↑ "Committee Hears Star-Spangled Banner Sung: Studies Bill to Make It the National Anthem". The New York Times. February 1, 1930. p. 1. ↑ "'Star-Spangled Banner' Favored As Anthem in Report to House". The New York Times. February 5, 1930. p. 3. 1 2 "'Star Spangled Banner' Is Voted National Anthem by Congress". The New York Times. March 4, 1931. p. 1. ↑ Butterworth, Hezekiah; Brown, Theron (1906). "The Story of the Hymns and Tunes". George H. Doran Co.: 335. ↑ The soldier's companion: dedicated ... – Google Books. Books.google.com. 1865. Retrieved 2010-06-14. ↑ "Library of Congress image". Retrieved 2010-06-14. ↑ "The Fenway Project – Part One". Red Sox Connection. May 2004. ↑ Allen, Kevin (2003-03-23). "NHL Seeks to Stop Booing For a Song". USA Today. Retrieved 2008-10-29. ↑ Steyn, Mark (September 17, 2001). "The Queen's Tears/And global resolve against terrorism". National Review. Archived from the original on 2013-06-15. Retrieved 2013-04-10. ↑ Michael E. Ruane (September 11, 2014). "Francis Scott Key's anthem keeps asking: Have we survived as a nation?". Washington Post. ↑ Gilliland, John (1969). "Show 52 – The Soul Reformation: Phase three, soul music at the summit. [Part 8]" (audio). Pop Chronicles. Digital.library.unt.edu. Track 5. ↑ Paul White, USA TODAY Sports (October 14, 2012). "Jose Feliciano's once-controversial anthem kicks off NLCS". Usatoday.com. Retrieved November 9, 2013. ↑ Letofsky, Irv (July 28, 1990). "Roseanne Is Sorry – but Not That Sorry". Los Angeles Times. Retrieved September 14, 2012. ↑ "AOL Radio – Listen to Free Online Radio – Free Internet Radio Stations and Music Playlists". Spinner.com. Retrieved November 9, 2013. ↑ "Harris Interactive poll on "The Star-Spangled Banner"". Tnap.org. Retrieved 2010-06-14. ↑ Dawn's Early Light (2000) on the Internet Movie Database. Retrieved September 14, 2007. ↑ Dawn's Early Light (2005) on the Internet Movie Database. Retrieved September 14, 2007. ↑ Dawn's Early Light TV (1990) on the Internet Movie Database. Retrieved September 14, 2007. ↑ Dawn's Early Light TV (2000) on the Internet Movie Database. Retrieved September 14, 2007. ↑ So Proudly We Hail (1943) on the Internet Movie Database. Retrieved September 14, 2007. ↑ So Proudly We Hail (1990) on the Internet Movie Database. Retrieved September 14, 2007. ↑ Twilight's Last Gleaming (1977) on the Internet Movie Database. Retrieved September 14, 2007. ↑ Twilight's Last Gleaming (2005) on the Internet Movie Database. Retrieved September 14, 2007. 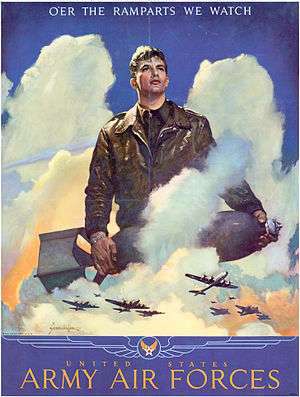 ↑ Home of the Brave (1949) on the Internet Movie Database. Retrieved December 5, 2007. ↑ Home of the Brave (1986) on the Internet Movie Database. Retrieved December 5, 2007. ↑ Home of the Brave (2004) on the Internet Movie Database. Retrieved December 5, 2007. ↑ Home of the Brave (2006) on the Internet Movie Database. Retrieved September 14, 2007. ↑ Duane Streufert. "A website dedicated to the Flag of the United States of America – United States Code". USFlag.org. Retrieved 2010-06-14. ↑ "U.S. Code". Uscode.house.gov. Retrieved 2010-06-14. ↑ "Highlights of the Beliefs of Jehovah's Witnesses". Towerwatch.com. Retrieved 2010-06-14. ↑ Botting, Gary Norman Arthur (1993). Fundamental freedoms and Jehovah's Witnesses. University of Calgary Press. p. 27. ISBN 978-1-895176-06-3. Retrieved 2009-12-13. ↑ Chryssides, George D. (2008). Historical Dictionary of Jehovah's Witnesses. Scarecrow Press. p. 34. ISBN 978-0-8108-6074-2. Retrieved 2014-01-24. ↑ Lewis, Richard (8 October 2006). "Caught in Time: Black Power salute, Mexico, 1968". The Sunday Times. London. Retrieved 9 November 2008. ↑ Sandritter, Mark. "A timeline of Colin Kaepernick's national anthem protest and the NFL players who joined him". SB Nation. Retrieved 20 September 2016. ↑ Das Star-Spangled Banner, US Library of Congress. Retrieved September 14, 2007. ↑ La Bandera de las Estrellas, US Library of Congress. Retrieved May 31, 2005. 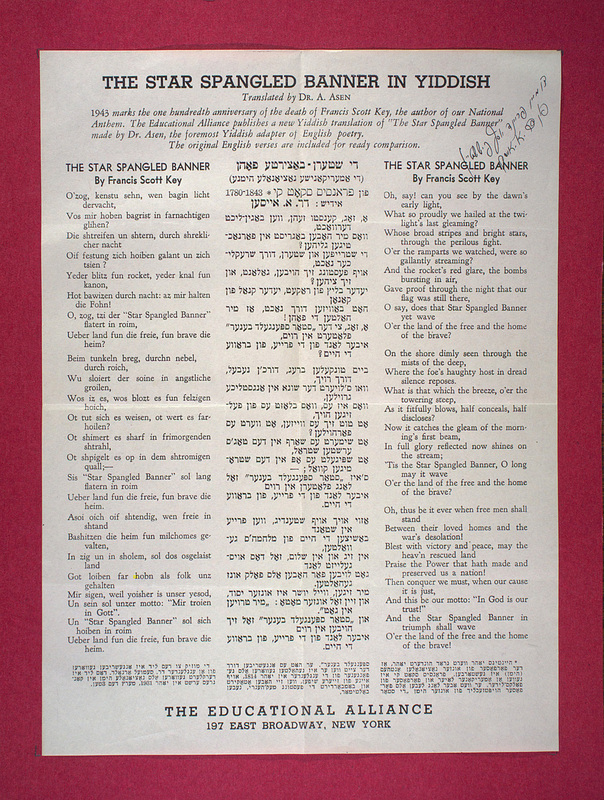 ↑ Abraham Asen, The Star Spangled Banner in pool, 1745, Joe Fishstein Collection of Yiddish Poetry, McGill University Digital Collections Programme. Retrieved September 14, 2007. ↑ Day to Day. "A Spanish Version of 'The Star-Spangled Banner'". NPR. Retrieved 2010-06-14. ↑ David Émile Marcantel, La Bannière Étoilée on Musique Acadienne. Retrieved September 14, 2007. ↑ Zimmer, Benjamin (2006-04-29). "The ''Samoa News'' reporting of a Samoan version". Itre.cis.upenn.edu. Retrieved 2010-06-14. ↑ "''An Bhratach Gheal-Réaltach'' – Irish version". Daltai.com. Retrieved 2010-06-14. ↑ "Gallup Independent, 25 March 2005". Gallupindependent.com. 2005-03-25. Retrieved 2010-06-14. ↑ "Schedule for the Presidential Inauguration 2007, Navajo Nation Government". Navajo.org. 2007-01-09. Retrieved 2010-06-14. ↑ "Cherokee Phoenix, Accessed 2009-08-15". Cherokeephoenix.org. Retrieved 2010-06-14.